These sticky ribs are brushed with an incredible sauce made with grilled blackberries. The Fourth of July is right around the corner! Get some grilling practice this weekend with these ten incredible recipes for ribs. What's Tim Byres's secret to delicious ribs? Rubbing them with a seasoned beer-based mop before cooking them in a foil packet ensures the meat is flavorful and moist. This savory-sweet Korean-style ribs recipe is quick and easy to make after marinating overnight. "Lamb ribs are the most inexpensive and unsung part of the lamb," says Tom Mylan, who flavors them with Middle Eastern seasonings. This recipe calls for three types of ribs, but it's just as fantastic with one. An easy blackberry sauce flavored with adobo chiles takes these ribs to another level. Vadouvan, a French curry-esque spice blend, adds terrific flavor to these tender ribs. These smoky, Mexican-style ribs feature a super-simple rub. Instead of braising, these ribs are marinated overnight in a mix of apple juice, lemon juice and soy sauce so they're sweet, salty and tangy. 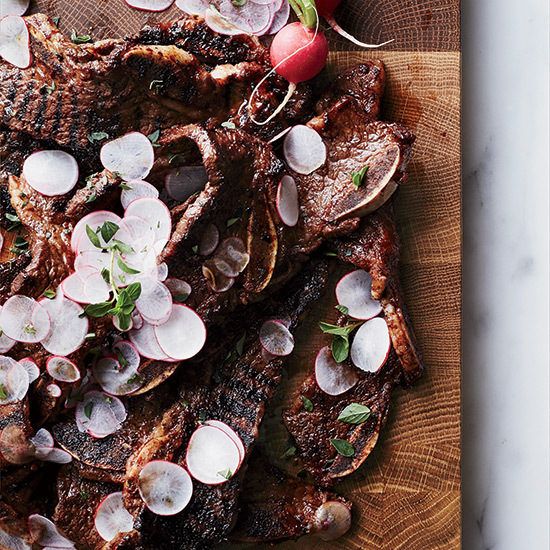 These thinly sliced short ribs are perfect for quick grilling. Susan Feniger's sweet ribs are delicious with a grapefruity IPA.